VirWoX stands for Virtual World Exchange and is an online exchange services that facilitates the buying and selling of virtual currencies. The exchange is very well established as they were founded back in 2007, which is before Bitcoin and cryptocurrencies were even invented. VirWoX started out as an online exchange platform for the trading of virtual currencies that can be used in online games and virtual worlds. While the exchange still does this in a big way, VirWoX also started facilitating the exchange of Bitcoin on their platform in 2011. However, the exchanging of Bitcoin is only a small aspect of VirWoX as they still have a large user base who exchanges online virtual currencies. As VirWoX has been around a long time, the have built up a customer base of over 1 million users, however, not all of these users are active. 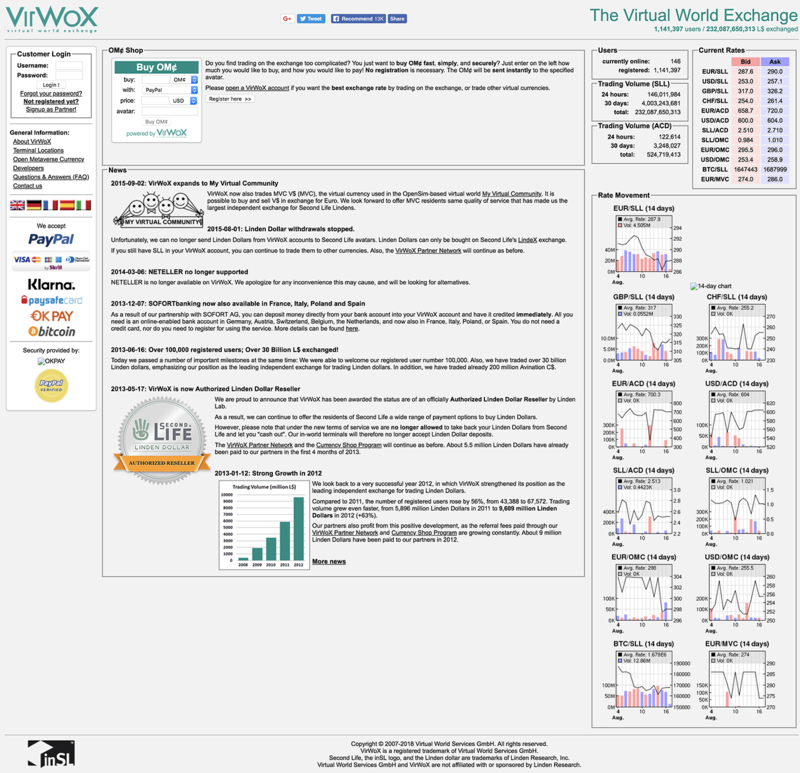 VirWoX is owned and operated by Virtual World Services GmbH and is headquartered in Vienna, Austria. The exchange is not regulated by any serious regulatory authorities, but VirWoX has been offering reputable exchange services since 2007. While VirWoX is a rather unusual virtual exchange that offers virtual currency and Bitcoin trading, are they a good exchange for you? Find out in the following review where we delve deep into all aspects of this exchange and discover whether VirWoX is right for you. The exchange trading platform featured by VirWoX is a web based platform that’s accessible via any desktop computer and most every kind of web browser. The platform is very dated and feels as if it is from the 90s. However, this does not take away from the exchange platforms functionality and reliability. The platform is fairly straightforward to use and understand, especially for the generation that is used to this style of website/platform. All in all, the platform is quite advanced and features all of the information an experienced trader needs to understand the market and analyze the prices of various tradeable assets. The platform features various charts that show the number of users online, trading volume of various virtual assets, popular trading pairs, price graphs, and more. Upon clicking on any of the price graphs, the user will be taken to a market depth overview page where they can view various aspects of the trading pair. Traders can place both market orders and limit orders and features fast execution speeds. All in all, the trading platform is quite sophisticated and can accommodate both beginner and experienced traders. VirWoX primarily offers the trading of virtual currencies that are used in the online world of gaming and such. Most of the virtual currencies offered on the VirWoX exchange can not be used any where other than online games and virtual worlds. The market that VirWoX serves is very much a niche market and the virtual currencies offered can be exchanged for one another and for fiat currencies including the US Dollar (USD) and the Euro (EUR) See below, the virtual currencies supported and offered by the VirWoX exchange. In addition to these virtual gaming / virtual world currencies, VirWoX also supports the exchanging of Bitcoin (BTC). Bitcoin can be purchased with PayPal on VirWoX by using PayPal to purchase SSL and then exchanging SSL for BTC (Bitcoin). The fees imposed on VirWoX users are rather high compared with other exchanges. However, there are very few virtual currency exchanges where users can trade the virtual currencies offered here. As well, VirWoX is the only exchange where users can use PayPal to buy Bitcoin. See below the associated trading fees. In addition to the trading fees listed above, VirWoX also imposes high deposit and withdrawal fees on fiat currencies. The fees vary between methods and can be found on the VirWoX website. VirWoX is a very legit virtual currency exchange as they have built up a viable reputation over the years. The exchange is employs the top of the line security measures to protect their users but does not release any information regarding their security measures.  VirWoX has a strict user policy and have banned users in the past for practices they do not tolerate. User accounts are only password protected and no two factor authentication methods are available. All in all, VirWoX is a safe, fair, and reliable exchange. However, it lacks some security features and the transparency of their security practices. VirWoX features an extensive FAQ section on their website that guides users through all aspects of their exchange service. The information provided here is very comprehensive and complete. As well, VirWoX features a walkthrough guide explaining how to use the VirWoX services. If a user still needs help, they can contact customer support via email. The VirWoX virtual currency and Bitcoin exchange is a very unique and well established exchange service. The platform provided to users is very simple yet sophisticated and has a 90s look and feel. Traders have access to all the tools and features needed to understanding market sentiment and confidently trading the various virtual assets supported. VirWoX supports a number of viable payment and withdrawal methods and is the only exchange that allows users to buy Bitcoin through PayPal. All in all, the VirWoX exchange is a viable option for some, but is not for everyone. The following are the common questions that customers inquired about VirWoX. No, VirWoX is a legit exchange that has been around a long time. VirWoX is based out of Vienna, Austria. VirWox offers an easy to use platform to access the market. They also have some convenient extras that other brokerages don't offer. 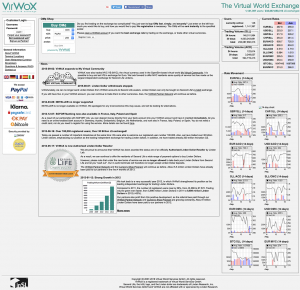 VirWox has higher than typical fees and commissions. They also offer less than typical financial instruments. VirWox has been around for a while and offers a sophisticated trading platform that established traders might enjoy. VirWox is outdated and has higher than average trading fees.